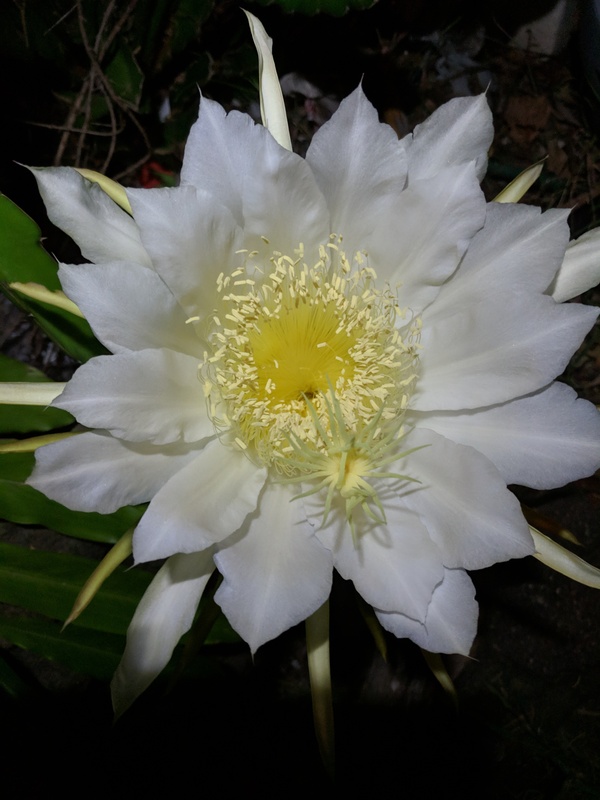 Recently, I had the pleasure of observing the night flowering Hylocereus undatus as it bloomed. This is the flower of the pitahaya or white fleshed dragon fruit. Catching the plant in flower can be tricky if the plant is small like mine, (it had only one flower) and it blooms only over one night between dusk and dawn. It is easy to overlook the emerging bud as you pass the plant so keeping an eye out from time to time over March and April when the plant is likely to flower in Sydney is important. The flower is about 25-30cm long and 15-17cm wide and is so spectacular and fragrant that it is really worth the effort needed to see it bloom. I have posted a series of images taken from 7:00pm through to 12:00pm the following day. The flower bud begins opening at dusk and reaches full bloom around midnight then at dawn it begins to gradually close. Below, the the outer green tepals of the bud that had been previously tightly held around the flower begins to loosen and bud begins to open. The image below was taken around 7:00pm. This was just as the mosquitoes were swarming and it was a challenge to get the early images. The outer tepals begin to draw back. As the outer tepals open we can see the white inner tepals. As night fell the flower began to unfurl showing the inner ring of white tepals. Below is the spectacular bloom fully open at midnight and so fragrant. The delicate white tepals looked like feathers. Next morning, around 7am the flower was closing but gave an opportunity to observe it in daylight. The image below shows some detail of the delicate stamen filaments ( with the anthers at the tips), the male part of the plant, around the throat of the flower and the long style with the stigma around the top of it, the female part of the flower. The nectar chamber is about 30 cm long. Click on the image for more detail. Around midday it was fully closed and the flower collapsed. What a beautiful flower. 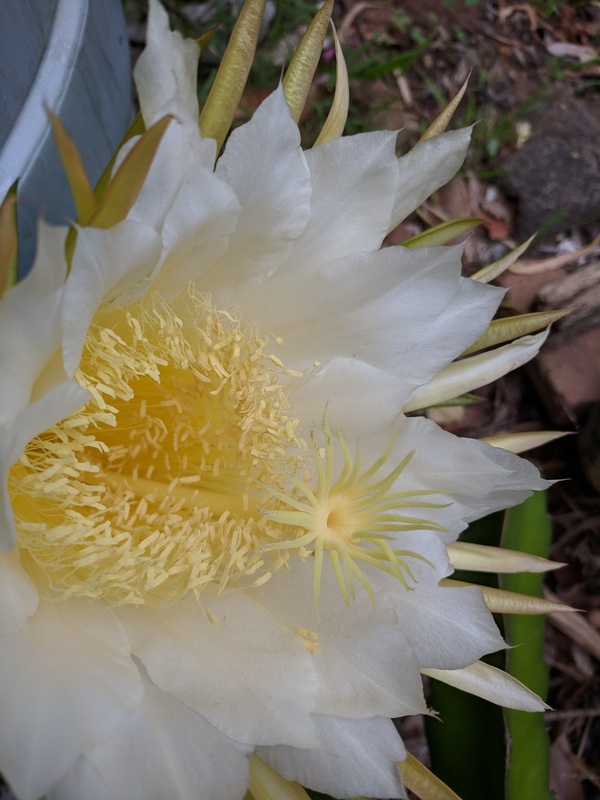 It was well worth the wait to see it bloom and to share these images with you, even it I needed to go outside every hour or so, with a headlamp to allow me to be handsfree to take the photos! In my next post I will take the story further to show you how to grow the Dragon Fruit and how the fruit develops.